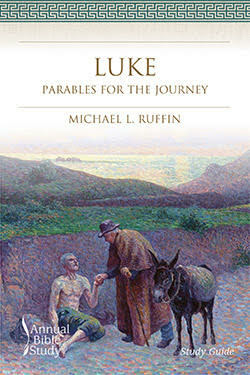 This study focuses on Jesus’ parables that are unique to the Gospel of Luke. These parables are stories that, according to Luke, Jesus shared with his disciples as they accompanied him on the most crucial journey they ever took together—the journey to Jerusalem. There Jesus would die, and there the disciples would learn of the true nature and cost of following him. These stories in Luke’s Gospel are pilgrimage parables. They are parables for those on the way to being the people of God. They are not places where we stop and stay; they are rather places where we learn what we need to learn and from which, equipped with Jesus’ directions, we continue the journey. But we will see that they are also places to which we repeatedly return. Because it became Scripture, Luke’s Gospel functions for us as it has for generations of believers through the centuries: as our guidebook while we try to find our own way in following Jesus. Like Jesus’ first disciples and like Luke’s original audience, we want to follow Jesus in taking up our cross and laying down our life. Michael L. Ruffin is Connections Editor with Smyth & Helwys. He served as a pastor and a university professor prior to joining Smyth & Helwys in 2015. He is a graduate of Mercer University and the Southern Baptist Theological Seminary. He and his wife, Debra, live on the Ruffin Family Farm in Yatesville, Georgia. They are the parents of Joshua, who is married to Michelle, and of Sara, who is married to Benjamin. You can visit him anytime at MichaelRuffin.com. This Study Guide for the Smyth & Helwys Annual Bible Study on Luke’s parables serves three purposes: to educate the learner on major issues of appropriate interpretation, to offer an overview of theological themes, and to build the learner’s Bible study skills by reviewing significant interpretations. Each session comes with thoughtful questions for reflection and discussion.